Awesome intro to multipitch and trad! We opted for the traverse. Seems like it would be an unpleasant swing if someone fell but it's not a challenging traverse. The route was busy as expected, especially since we went during the 2 week window of perfect Vegas fall climbing weather, but we had a great time. I have to assume this route is great. Tried it with a friend about twenty years ago. Thought we knew where we were going, didn't read up on the route enough to really know where we were supposed to go. Ended up way left on much more difficult climbing. Up to that point everything at Red Rocks was graded pretty soft and here we were suddenly climbing our asses off on a 5.6. Not sure what we ended up climbing, but it was a sight more difficult than 5.6. Always nice to go out for a good easy climb and come back spanked, wondering where it went wrong. Definite 5 stars if you continue to the top! I linked the traverse pitch, and since Hadren describes this option as being 5.6R, placed too much gear on the traverse (expecting each placement to be the last before the crack). In fact there's plenty available, and the climbing isn't 5.6, so you could get by with probably 1 placement. I had so much rope drag at the top that I had to pull about 15 feet of rope through in order to do the last moves, which made the final runout even more scary! For the continuation, keep right at the start - we set off left, ended up on rubble-strewn ledges and had to down-climb. The final 5.7 chimney pitch was great (climbing with sacks so we had to haul these up). After the initial chimney, I was tempted left, but met with a choice between an unprotected face, or an unprotected blind corner, so reversed back into the corner. Looked loose but wasn't (though if anything does fall out it's going to be BIG). The final short scramble to the summit turned out not to be that short, and route finding was non-obvious, so took a while. Had intended doing the long 'hiking' route out (as described by Hadren) but light was fading so we followed cairns north from the notch, these led back right to a gully which we descended with 2 long rappels. Quite exciting as it was pitch dark by then, and we didn't know if our ropes (double 50m) would reach the bottom - they did, but on the 2nd rap it was a close thing! (there are some slings around some chockstones half way down, presumably left by someone with a single rope). The first three pitches are not very good. The last pitch is on amazing black varnished rock with great exposure. The view from the top is awesome. 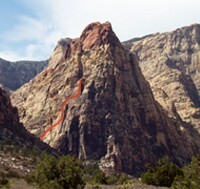 If you could stack 5 pitches similiar to the last pitch this route would be perfect. For Beginners, Make sure you put long enough slings on this route or rope drag becomes a nightmare. Did this with friends last Saturday 3/25 as my first long route at Red Rocks, lots of fun! The traverse pitch protected well the way I went, which was important for the psyche of one of my partners. We were first inspite of not finding the base right away (walked by it going up canyon). Ran into an other Supertopian for a very cruisey climbing day. Great route. Did it on a very cold day, though and were happy to rap down as soon as possible. Otherwise it would have been a lot of fun to explore the top. Ran the last 2 pitches together with very little ropedrag. I even was able to walk past the anchors (after clipping them) without a problem. I think you just need to put a long runner on the first bolt and not worry about too much gear on the inital traverse. I think I place one piece. If you're comfortable leading at this grade, don't bother doing the full traverse. If you need to place more gear, do the traverse, cause I guess you'll get a lot of rope drag otherwise. For those considering this route- go to the top!! The summit of Mescalito is simply amazing and well worth the trip. Walk off the back of the formation and drop into the north side of the canyon. Stay high and follow the cairns (you should not have to rappel at all)- have fun!! Also, if the route is busy or you're interested in a slightly more difficult day, consider the Cookie Monster Variation start- a 3 pitch 5.7 classic line that ascends the large left facing corner on the east face visible in the picture above. From the top, step left to Cat and continue up! Finally, some general beta on rapping the route: if you're productive and comfortable at 5.6, this route can be rappelled with a single line. From the top, rap to the intermediate bolted anchor. Then rap to the block below. From here, rap down and to the climbers right to a ledge. Downclimb from here to the anchor below (easy stuff, 5.nothing). From here, rap to the terrace and walk down to the next anchor. Rap from here to an intermediate station about 50' below. From here, one long rap reaches the ground. The two times I did the route I linked the traverse pitch with the last with reasonable rope drag. I clipped the bolt at the corner, then did the traverse and climbed up about 20' before placing more gear. A bit fo a runout, but it made things reasonable for the follower. The anchors at the top are a leap of faith, you get the 30' warning from your partner with nothing but small knobs and slab as far as you can see, a few feet later they pop into view. As of 10.23.04, the rappel slings on the tree station and the block station above it have been replaced with new webbing and the junk has been cut off. On the last pitch, it is useful to note that the anchors are on the flat top and that they may not be readily visible. Just go up and slightly to the left of the bolt and you should find them. Definitely do the traverse pitch, it's short but fun and it prevents rope drag, as other climbers have said here. Downclimb one or two moves to a little ledge, follow it around the corner and you're all set. We ticked it on 4/16 with a solid 4 parties in front of us. Made for a huge cluster! @#$% with parties rapelling on us. Make sure you get their early!!! climbed tihs on 4/18/03 ..
the rock quality is excellent .. loved this route..
.. on the last 2 pitches -- dont link the traverse with the last pitch! .. it will give you the worst rope drag ever! .. i was climbing on double ropes and decided to link them .. ugh! .. by the time i arrived at the runout slab at the top of pitch 5 it was like lifting weights ..
.. it made the 5.6 runout feel alot harder .. The supertopo was great! I would just add that at the top of pitch two there is a small chimney before you get to the ledge with bushes. Watch out for knot drag on the double rope rappels. Cat in the Hat is the friendliest and most popular route of its grade in Red Rocks.